Don’t we all wish for an ESCAPADE once in a while? Escapade : fr. 1570 : it. scappata, or sp. escapada - adventurous action that runs counter to approved or conventional conduct, or one’s accomplishment to escape obligations and habits of daily life. In her previous 4 albums (Montréal Concerto, Tandem, Española, Valses & Impromptus), pianist Marie-Andrée Ostiguy presented us with romantically inspired works. This time, she allows herself an ESCAPADE into the world of MOZART, most particularly in his music written for young performers. She invites us to discover the 6 VIENNESE SONATINAS – a Canadian first – for which she signs her own piano transcription, faithfully inspired by the Divertimenti for three basset horns KV 439b. To complete this 76 minute CD, she also offers us the famous “AH! VOUS DIRAIS-JE, MAMAN” VARIATIONS (Twinkle, twinkle, little star), the Sonata in C major KV 545 “Facile” and the RONDO ALLA TURCA. Performed by Marie-Andrée Ostiguy on the Yamaha CFIIIS piano and realized by Henri Brassard, this album was recorded in Québec, at the Saint-Hilaire Church, on September 12, 2002. ESCAPADE sparkles with transparence and exuberance. 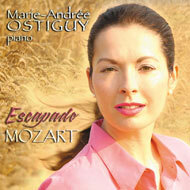 ESCAPADE will inspire young pianists and their parents to discover and explore other interesting works by MOZART. Without a doubt, ESCAPADE will bring many good memories to the young at heart.